Recently, I have been participating in a travel forum giving advice to various travellers who want to visit Japan. This is the Virtual Tourist forums. There are lots of people who need help with information on various locations around Japan and I do my best to provide them with as much information as needed. I don’t have all of the information, but being a resident, I have a different viewpoint compared to those who have just visited Japan. While I may have some knowledge in some things, I’m surprised by how much information travellers have, and can remember after a trip. In the last few months, I have seen people ask about transportation in Japan, and sometimes specifically about Tokyo. I have written that the Yamanote Line is one of the easiest ways to get around Tokyo, and I suggested methods to get information on how to get around Tokyo by subway. There was a major reason as to why I wrote about the subway system itself rather than the Yamanote Line. Many tourists seem to pride themselves that they can easily get around Tokyo using just the Yamanote Line, and that the JR lines are better than the subway lines. This, I think is not true and actually, the opposite is true. The debate on which is better, Subway or JR, is something that people sometimes talk about, and people tend to have a unified voice. Of the various co-workers and students that I have talked to, the consensus is that the JR lines are worse than the subway lines. I’m not too sure why this is true, but this is just how it is. At the time of writing my post about Tokyo’s Subways, I hadn’t ridden the JR lines too often, so I didn’t have any real experience with them. Now that I have moved and lived in my current apartment for nearly a year, I can easily say which is better, and I completely agree that the subway system is much better. When we look at the morning trains, it doesn’t matter which train you take, it will be full. There really isn’t much of a difference on which company is better. However, during the day, and at night, this difference is very apparent. The first thing you will notice is that the people are generally more courteous on the subway. When you are getting on and off the subway, it’s more common for people to get out of the way, or get off the train. People don’t tend to crowd the platforms, or crowd the doors when they get on or off. Of course, this is not always true, but this is generally true. When the trains are really full, people don’t push to get off. More often than not, they just wait till the person in front moves and then they get off. I can’t tell you how many times my heel was stepped on while exiting a JR train that wasn’t full, while in a full subway, it’s less common to get stepped on. In a worst case scenario, people push, and this has happened a lot to me. I feel that people just don’t have any patience when exiting a JR train. In the daytime, the trains are not as busy so people don’t try to push you out of the way to get out, but the subways also get better in the day as well. It’s hard to truly explain the differences in words but if you ever get the chance to try it you will notice the difference. The crowding inside the trains is the other problem. In any train, people tend to “hang out” around the doors. On the subway, this is true, but if there are a lot of people, they tend to move into the train rather than insist that they stand at the door. 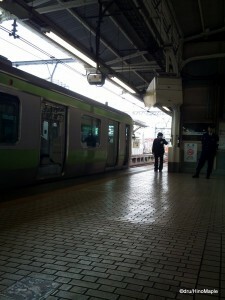 It seems that people who take the JR trains need to be near the door or they won’t get out first. They NEED to get out first or else the whole world will end. At least that’s my impression. My only plausible explanation is that they need to get out and run as fast as possible to make a train connection, but at the same time, if the train is late, they won’t make it anyways. Sometimes, there can be a lot of space around the benches and the door area will be packed, yet no one in the door area will move as they feel they won’t get out. It’s unbelievable that people would do that, but that’s life on the JR lines. The best part of riding the JR lines is the fact that it can get you to almost any location in Tokyo. There are only a few locations that can’t be accessed by the Yamanote and Chuo lines. 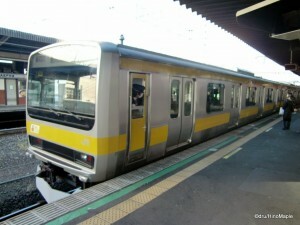 I do recommend the JR lines when travelling in Tokyo for their ease of use. It’s a great tool, but I still prefer the subway. It’s more complicated, and you can’t use your phone as often, but at least it isn’t as busy and you will keep your sanity longer than on the JR lines. 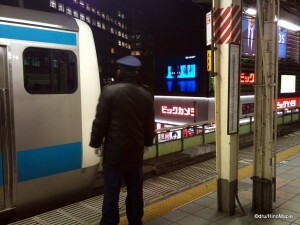 Trains in Tokyo – Redux are my updated thoughts about the train system in Tokyo. 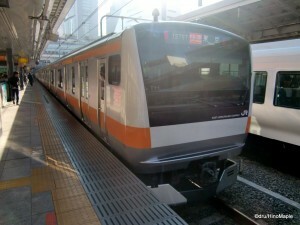 To read more about trains, continue to Subways of Tokyo. 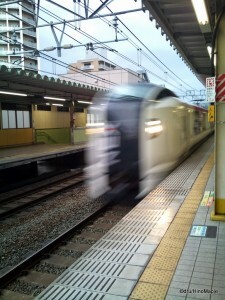 This entry was posted in Kanto, Tokyo, Trains and tagged japan, JR, tokyo, trains by Dru. Bookmark the permalink. OK, here’s a new theory in the debate about JR vs Metro trains. JR stations tend to be in central locations, with lots of restaurants/bars nearby. You so often see totally plastered salarymen at JR stations and on JR trains. Metro stations, on the other hand, are less central, more suburban. Whatever the reason may be, there are fewer drunkards on Metro trains. Or is it my imagination? I don’t agree with that. I think that there subways are all convenient and there are more stops at the major centres than the JR Lines. It just appears that there are more stops in the central core for JR Lines. In terms of drunkards, there are fewer on the subway because the last train on the subway stops earlier. Trying to get out of the city, or to your home on the subway requires you to go home by 11:50 latest. On the JR Lines, you can head home at 12:00, or even 12:30 in my case. The last train leaving the city is usually around 12:30 or later. Then there is the Yamanote that stops at 1am. Behaviour? I think people are just worse. It’s been over a year since I wrote this post and I have joined the ranks of the crabby on the JR Lines. I hate how I do this now, but I try as hard as I can to be more courteous. My only guess is that a lot of people are coming in. Even though the subways are connected to the commuter lines, a lot of the time people get out at the terminal station rather than continuing on. The Oedo Line would routinely clear out at Shinjuku with less than 50% staying for a longer trip. When I take the Hanzomon from Shibuya, near the rush hour, a lot of people get out at Shibuya and the Hanzomon is pretty empty in the city. People often make similar complaints about using the private lines outside the city too such as the Den-en-toshi, but it seems to be a bit more civilized from what I’ve heard. Thankfully I never have to deal with those lines yet. Another great article. Thanks for sharing. For first time visitors you may want to mention the fact that while travelling with luggage you need to be prepared to carry all of your articles up or down flights of stairs at any given moment. Maybe all stations have escalators and elevators, but they may be hard for first time visitors to find. Or there may be construction like at the Ginza Shibuya station. I travelled from Asakusa to the monorail in July and was soaked with sweat by the time I got to there. Thanks for the comment Brandon! Being a 5 year old post, things have changed a bit. I agree that escalators and elevators are not very convenient. We do have to be mindful that they were usually added as an afterthought rather than part of the station design. I have also gotten very drenched because I didn’t do my homework properly to find where the elevators or escalators are. Shibuya is actually a big cluster-f*** right now. It went from being a somewhat manageable station to outright unbearable. It will be a few more years before that is all fixed just before the Olympics. I actually was closer to the Ginza line and took that to Ueno so I could ride the Yamanote straight to Hamamatsucho. Using the subways is awesome I but learned to use the JR lines on my last trip ( I was perplexed by the above ground trains on my first trip) and like taking in the scenery from those. I find the all the aspects of transportation in Tokyo fascinating. But I have only been a tourist in Tokyo. Using it daily would probably get old fast. And I have seen the small boards you mentioned with the info and escalators and elevators but I don’t always remember to use them. I look forward to more blog posts and thanks for responding so quickly. Ah, that route. Yeah, the transfer at Ueno is not really good. Pretty far too. For sanity, and to avoid a sweat shower, I might have taken a taxi to Ueno. I agree that JR is pretty good as it is above ground and good to see everything. As you mentioned, being a resident is completely different. I’m so used to seeing everything here that I don’t get so awestruck by the scenery. I still enjoy looking out at what has changed over the years though. Just a small interesting fact about those boards with station info, a woman with a small child was fed up trying to find the best subway car for her family so they could get onto the elevator quickly that she started to make her own notes. When a station worker noticed, he asked her what she was doing and eventually she was offered a job with Tokyo Metro to work on that. Now it is pretty standard but JR is still going a bit slow with it.